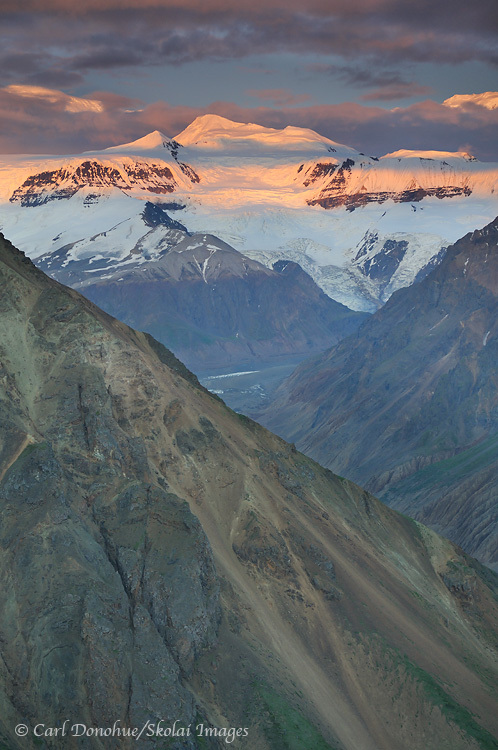 Chitistone River and University Range, Wrangell - St. Elias National Park and Preserve, Alaska. Please click on the image above to view a larger version of this photo. 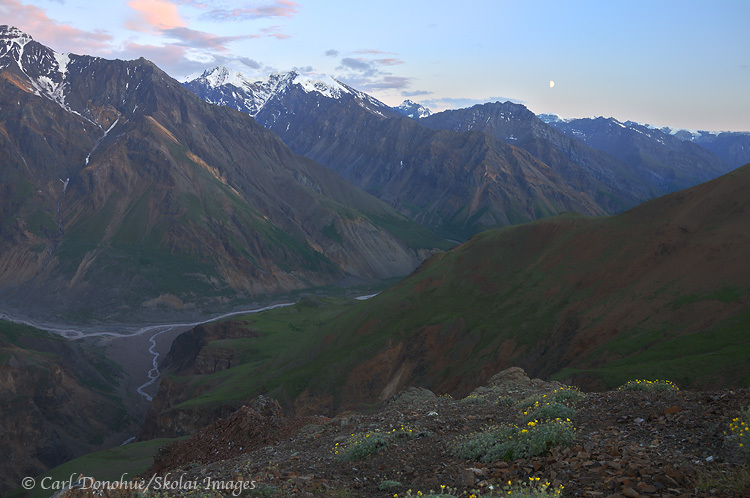 Another frame from the evening after crossing the Goat Trail, this one looking west down the Chitistone River, as it pours toward the Nizina River a few miles down from here. This hike is the first trip I ever made in Wrangell – St. Elias National Park, and one of the first I ever did in Alaska. It’s always a real treat to return to the area and walk this valley again. The Chitistone Canyon is absolutely spectacular, and a fantastic backpacking trip. Views like this don’t happen everyday, which made this particular trip even more fun. We had pretty good weather most of the trip, no bugs, and lots of laughs. Just what a trip to the mountains should be. 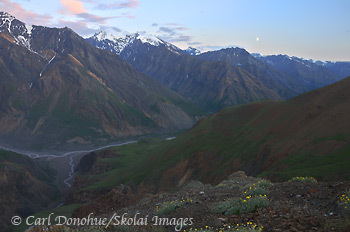 This entry was posted in Adventures, Alaska, Backpacking and Hiking, Landscapes, Wrangell - St. Elias National Park and tagged Chitistone River, Goat Trail, scenics, University Range, Wrangell - St. Elias National Park on July 21, 2011 by Carl D.
Sunset over the University Range and Chitistone River, Wrangell - St. Elias National Park and Preserve, Alaska. Please click on the image above to view a larger version of this photo. A shot from a recent hike down the Chitistone Canyon; this frame looks south toward the University Mountain Range and the Chitistone Glacier. We’d hiked across the Goat Trail, a series of steep scree slopes that require a little attention, and made camp on a nice little plateau high above the Chitistone River. Dinner on the hillside and an evening with a spectacular view made a great end to a great day’s hiking. The trip was a blast. We had good weather for the bulk of it, which cleared the way for great big views. We saw all the major mountains in the area, including the massive Mt. Bona and Mt Churchill, the Grand Parapet and the Twaharpies. We also saw a gaggle of grizzly bears (7 total, including a sow with 3 spring cubs), a fox, ground squirrels, golden eagles, ravens, ptarmigans, Dall sheep, mountain goats, and myriad ground nesting migratory birds. Flowers were in full bloom and we had a good time with the guide book reviewing images and identifying as many as we could. Verna Pratts’s great guidebook on Alaska wildflowers is a great reference. For the most part we figured all of them, but a couple of mystery flowers had us all scratching our heads. Mostly though, we hiked, napped, looked around, joked and chattered our way through a truly wonderful landscape; mountains and glaciers piled on top of mountains and glaciers. Good times indeed. And I’m heading back to the area this week for more of the same. This entry was posted in Adventures, Alaska, Backpacking and Hiking, Landscapes, Wrangell - St. Elias National Park and tagged Chitistone, Landscapes, scenics, University Range, Wrangell - St. Elias National Park on July 17, 2011 by Carl D.
Mt Churchill and Mt. 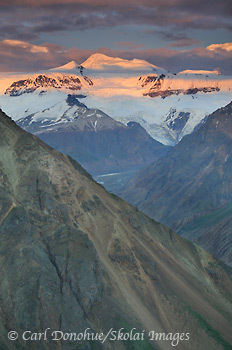 Bona, Wrangell – St. Elias National Park. Tallest peaks in the University Range, Mt. Churchill and Mt. 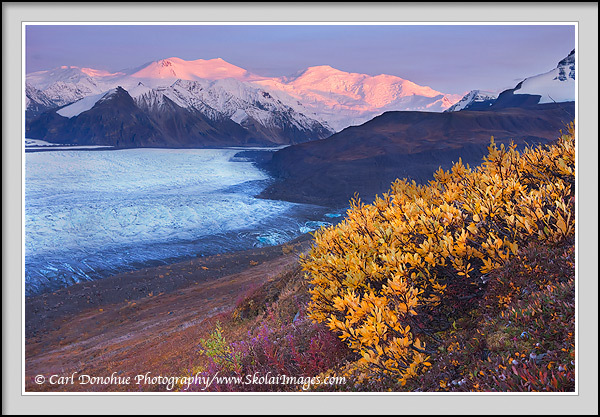 Bona rise dramatically from Russell Glacier, catching the last rays of the day, Fall colors in the foreground, Wrangell – St. Elias National Park, Alaska. This entry was posted in Adventures, Alaska, Backpacking and Hiking, Cool stories, Fall, Landscapes, Photo Tours, Wrangell - St. Elias National Park and tagged Chitistone Pass, Fall, fall colors, Glaciers, Landscapes, Mountains, Mt. Bona, Mt. Churchill, Russell Glacier, scenics, Sunsets & Sunrises, University Range, Wrangell St. Elias on November 13, 2009 by Carl D.